FARMINGTON, ME (April 5, 2019)—Julie Davis, director of athletics, fitness and recreation at UMF, announced that Benjamin J. White has been appointed director of the University’s Fitness and Recreation Center, effective April 1. A native of Auburn, Maine, White earned his bachelor’s in psychology at Stonehill College and a master’s in exercise and sport science at Oregon State University. His higher education experience includes serving as director of intramural sports at Oregon State University, assistant director of recreational services at Bridgewater State University, and director of recreation and aquatics at Brandeis University. 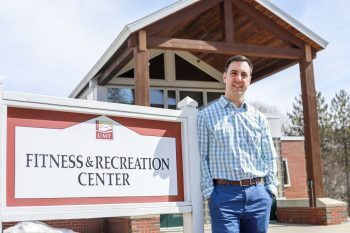 He also has been director of health and wellness at the Auburn-Lewiston YMCA and vice president and chief operating officer of DSE Rec Software, a Massachusetts-based company that provides recreation management software solutions to the college and university market. White’s appointment at UMF follows a national search that included feedback from numerous stakeholders across campus, as well as community members whose families use every aspect of the center. The search drew well-qualified applications from across Maine and from as far away as Alaska. As director, White oversees the University’s 42,493-square-foot facility, encompassing three multipurpose courts, a 1/8-mile track, cardio and weight rooms, and a 25-yard, six-lane pool. He is also responsible for the building’s staff of six professionals, 100 student employees, and the vast array of programming they deliver — everything from physical education classes, group fitness instruction, and intramurals to personal training, aquatics, and the Mainely Outdoors Program. With 120,000 visits each year, it is a hub for physical activity in Franklin County.